Under Dárdai, Hertha have operated largely in a 4-2-3-1 shape through the season and used a consistent selection of players in a squad which has seen strong additions in recent years such as Kalou and Darida. The squad they have assembled is full of talent and ranks 6th in the Bundesliga for average GoalImpact despite their 15th placed finish last year. On this basis, their current position at 3rd in the Bundesliga is not a huge over-performance, especially considering the recent lack of form from Leverkusen as well as Gladbach’s weak start to the season under Favre. With a particular focus on their play with the ball, this piece hopes to break down the tactics behind their leap up the table this year – starting with their structural dynamics. One of the stronger aspects of Hertha’s game lies in this spacing with the ball. Particularly within the central midfield three, they space themselves effectively in a dynamic structure which allows them to manipulate and open space through the centre of the pitch. Although it can be at times somewhat disordered and chaotic through the imperfect timing of movements from the midfield, it generally works well to support their possession game in numerous areas. The many positional possibilities of Hertha’s structure. From the left, Salomon Kalou is rarely standing still and if he isn’t moving towards the wing to make space for Ibisevic or Darida, he’s drifting through the centre and the right half-space or dropping deeper to support in the midfield spaces. Darida has lots of possible movements too and often drops deeper off of the ball, sometimes acting as the deepest midfielder during build-up. 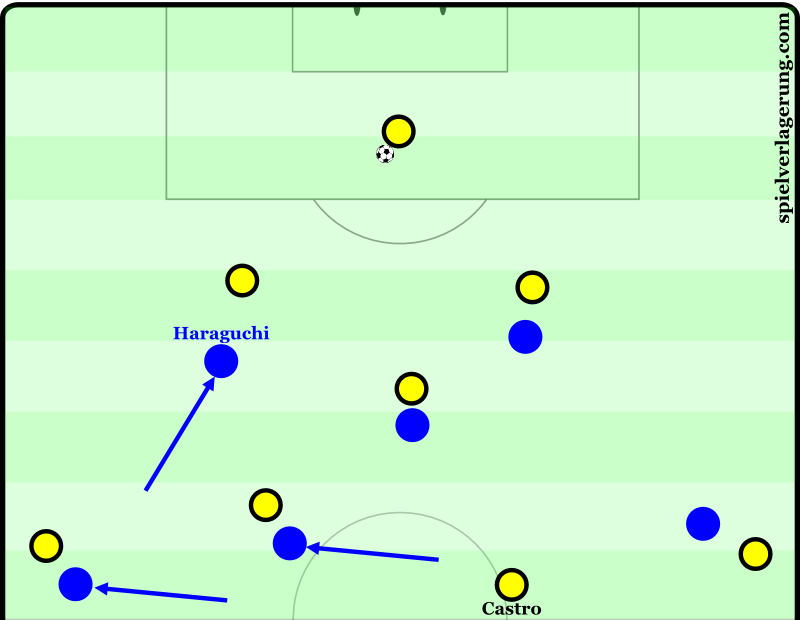 On the right, Haraguchi is also active without the ball, and often moves towards the right wing where he can receive possession. Although in doing this he opens space for the trio of Kalou, Darida and Ibisevic, these movements are often the weakest as he has limited threat from such a wide position. The inside movements of the two wingers are often used to provide space for the two Hertha full-backs. This is one of Hertha’s strongest positions on the team as Plattenhardt has been particularly excellent this year whilst Weiser can have a strong influence on attacks and has had many games starting as a winger in the place of Haraguchi. 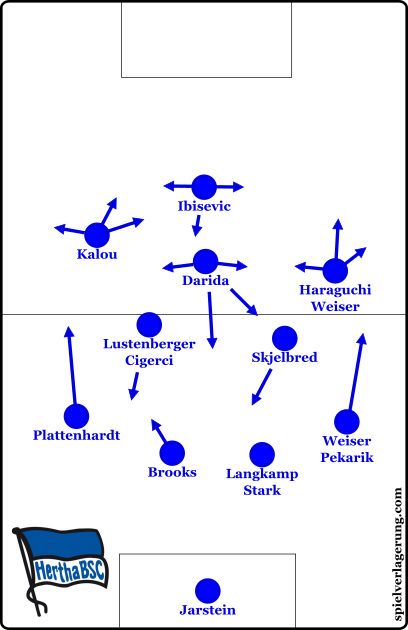 Most often on the left side of the attack, the winger (usually Kalou) will drift inside and leave the entirety of the wing-space open for Plattenhardt where he can stretch the opposition and open space both horizontally and vertically (increasing depth). Ibisevic is also crucial in the flexible positioning and will often drop into either of the half-spaces to occupy space left by the aforementioned attacking midfielders. In these moments he can receive and hold onto the ball well, giving himself the ability to bring others into play and allowing Hertha to progress the ball forward quickly with strong rhythm changes. The dynamic nature of their spacing is an important component of Hertha’s positional structure and it is rare to see any of the central players taking on a static position. Through their constant changing of position they are always adapting their structure to the moment which allows them a more situationally-optimal shape to support the ball. Another effect of this dynamism is the challenges it gives the opposition defensive scheme. Due to the perpetually-developing structure of Hertha, it becomes difficult for the opposition defence to cover these movements for long periods of time. 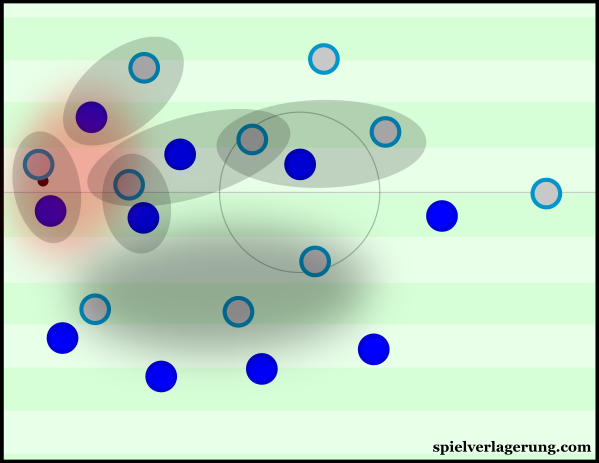 In a number of situations the Hertha midfield shifts its shape and rotates positions until a player comes free, usually by dropping into a deeper position away from the midfield. There is a patterned element to the movements giving some predictability, but they’re generally worked well enough in the timing and synergy to be effective. The effect of this dynamic structure is particularly interesting when faced with a man-oriented defensive system. In their 1-1 draw against Wolfsburg they came up against a man-oriented defensive system and were able to manipulate these orientations to open space in the centre. Hertha’s movements can force the markers out of position and thus open up space whilst because the defenders are focused on covering their man, the control of space can be weak serving little opposition to Hertha’s attempts to open gaps in the centre. On a theoretical level, a zonal defence is better-equipped to counter such a shape with as much movement, as they are less perturbed by the off-the-ball runs whilst the focus on controlling the space means Hertha will have a lesser capacity to manipulate it themselves. A defensive scheme in the style of Lucien Favre’s position-oriented defence could possibly be an effective measure against Hertha’s dynamism through paying much more attention to maintaining spatial coverage over tracking the movements. This aspect also allows Hertha to get the better of their opponents through dynamical superiority. Referring to the superiority in speed or timing of movements over the opposition, this concept comes in many forms. The simplest is a common example of a winger beating his man through simply being faster than him. A more complex being having quick, well-coordinated movements in combinations through midfield which are faster than the defenders’ defensive movements in reaction. The dynamic runs through the midfield allow Hertha to disorientate and disorganise their opposition, allowing them to generate free men and create flexible connections to play the ball through. The predetermined nature of the movements enhances Hertha’s ability to achieve this. Through having such patterns which they can call upon during the game, the likes of Skjelbred have a better capability to co-ordinate their movements well through previous practice and therefore can act quicker than their opposition. When they bring the ball out of defence, Hertha can use multiple pre-scripted movements and positional changes in midfield in order to make ball progression possible. It often involves the ball-oriented movements of one or two midfielders whilst the others adapt their shape to maintain balance and occupy any possible space that has been opened as a result of it. Starting out as a 4-2-3-1 shape, it is common to see Hertha quickly morph into a single-pivot structure as each of the three central midfielders has the potential to drop into the 2nd line on their own. Skjelbred has this responsibility the most and can also drop directly between the centre-backs when necessary, whilst Darida also makes many ball-oriented movements towards deeper spaces during the construction phase. In a single-pivot shape, a team can benefit from having better occupation of the midfield spaces higher up through the extra midfielder whilst in Hertha’s case, it can also open up the 10 space for the forwards to make use of. When Darida drops from the 10 position into the 6 space through the centre, the movement is usually accompanied by reactive movements from the two central midfielders. They commonly shift upfield slightly whilst moving out into their respective half-spaces and in doing so, these adjustments can allow the ex-Freiburg midfielder more space to receive the ball. Through this mechanism, Hertha look to make Darida free through strong timing of movements whilst it results in an often-important central presence on the 2nd line. Darida drops whilst the two CMs move out to give him space. Skjelbred’s dropping movements into the defensive line are also matched by adaptions of the rest of the midfield but understandably provoke a different reaction in the shift of the shape. Often starting on the right side of the midfield, the Norweigen midfielder drops diagonally into the centre to create a 3-chain in the first line. With the right half-space now usually vacated, Darida has the cue to drop into this now open space, creating potential for him to be free for a vertical pass forward whilst Lustenberger can also adjust his position accordingly. The result of both is a clear single-pivot shape whilst the triangle in midfield is maintained, just inverted. Hertha are still quite comfortable with just the two centre-backs in the 1st line of players however and are still quite effective in moving the ball without the 3rd player in the centre. They generally space themselves in their respective half-spaces when possession is within the 3 central columns whilst when the ball moves wide, you’ll see the ball-far centre-back move towards the centre to maintain the connection between the pairing. Unless they’re faced with a team such as Leverkusen, they can still keep a hold of the ball well whilst frequently switching to try and open up ways to progress possession into the midfield. These patterns are quite useful for Dárdai’s side as it allows them to have some form of standardisation in a phase where stability is crucial. If the act of bringing the ball out of their own third isn’t planned well, then the co-ordination of their movements can be missing and the process is much less stable. For obvious reasons, stability is much sought after during build-up and without it there can be some severe consequences especially in a league such as the Bundesliga which possesses numerous teams who are competent pressing machines. Hertha’s good timing of their movements as well as the strong co-ordination between teammates implies that it’s something they have put considerable work on off the pitch. The execution of these patterns is evidently at a high level and if even if they don’t always successfully open up the centre, they’re efficient enough for Hertha to readjust and quickly make another attempt. This is a common sight during the Hertha build-up where the intial movements of the midfield are defended well by the opposition and there isn’t a clear way of progressing forward. The midfield must then quickly readjust and then change shape again as they make a second attempt at creating a free man in the centre with different movements. The ball circulation during build-up is often quite slow when they fail to break the lines on the first attempt meaning that this can be an important factor in progressing the ball up field and increasing the rhythm as they get closer to the opposition’s goal. An interesting aspect of Hertha’s construction of possession is their use of the goalkeeper to help bring the ball out of defence. The large majority of teams ignore their ‘keeper when it comes to building up from the back and in doing so, they look over a valuable tool which can be used to great effect. In build-up and there’s not a single player free? Wrong! One of the greatest benefits of using the goalkeeper in build-up is the additional man it creates in their own third. Through actively being involved in the construction of build-up, he becomes another player which has to be accounted for by the opposition press and can help develop overloads in the first line much more easily. With the ball at his feet, Jarstein can eventually force the opposition forward to move and pressure him. At this point, it only takes a small movement out of the forward’s cover shadow for a midfielder to become free for a pass forwards. On a technical level, the Hertha goalkeeper is probably above average but the role of ability in passing is perhaps overstated in these situations. What I feel is more important is to have strong understanding of the situations and good positional ability, which makes the act of passing the ball much easier and less demanding. Jarstein has the freedom to situationally act as the 3rd player in the 1st line of players too. Instead of Skjelbred or Darida dropping into the line, it’s possible to see the goalkeeper move up during deeper build-up to form that three-chain. In doing so, he allows the would-be midfield dropper to maintain a higher position from which he can support the development in a different way. With an extra player higher up in the 2nd or 3rd line of players, Hertha have a better presence in the centre of the midfield which gives them better opportunity to perform a variety of actions such as create overloads or open a passing lane. The use of the goalkeeper in the 1st line gives greater potential to play through the centre. Through having a better occupation of the centre higher up, Hertha’s progression of the ball from build-up can be much more effective with the additional midfielder. There are simply more options to move the ball forwards and especially in Hertha’s case, greater possibilities for the variations of the dynamic movements to open up avenues into the centre. Without the ball, Hertha move from the 4-2-3-1 into more of a 4-4-2/4-4-1-1 shape with Darida supporting Ibisevic up top as they act mostly in a mid-block, advancing up the pitch to press in reaction to various triggers. A zonal system is used which is largely man-orientated and becomes more fixated on these orientations when pressing higher up the pitch for the purpose of having access to press the ball. Compared to most teams, these man-orientations aren’t as strict and clean as the average, with the distances between a defender and his man rather inconsistent. It’s possible to see some permutations in a lopsided 4-3-3 too when the opposition are building the possession in a wide area. Quite a normal variation of 4-4-2, the ball-near winger moves up to create access to the full-back whilst the ball-far winger tucks further inside to allow the midfield to shift over. With more of a ball-orientation in the shape it theoretically allows Hertha to have better access in areas around the ball and a generally better shape to defend wide areas. It should be emphasised that this is a shift which you can see in many teams who practice a 4-4-2, as the simplicity of the movements makes it an easy way to adjust the structure to the ball position. Through their man-oriented defence Hertha are able to establish quite an aggressive defensive game when necessary. By looking to have access to the (situationally relevant) individual players from their zonal position, they can quickly impose themselves in individual duels to support their defensive efforts. This was an important component when they managed to hold Borussia Dortmund to a goalless draw where they targeted Julian Weigl and Ilkay Gündogan in an aggressive man-marking scheme. The result was that neither were truly able to support their team and the away side were unable to play through the centre as well as they’re usually capable. An image from CE’s match analysis of the Dortmund draw. 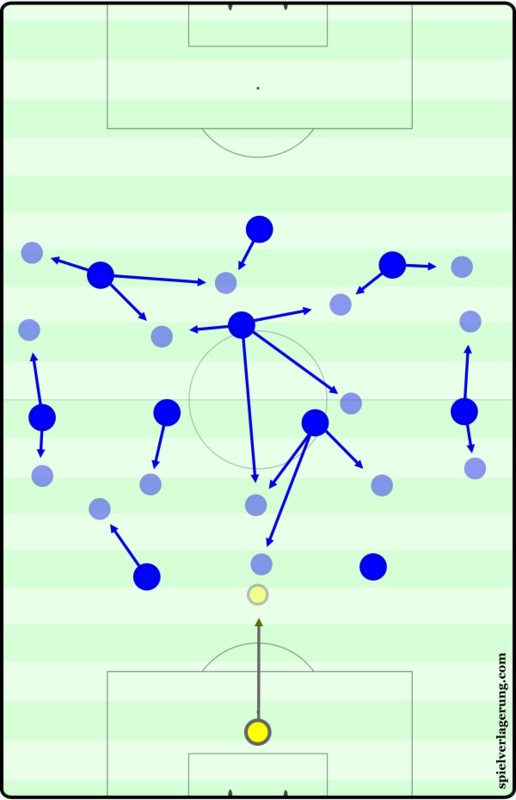 Hertha’s biggest issue during these pressing moments is in maintaining their compactness through the shape as they leave open gaps which can be exploited if the press is bypassed. Their horizontal compactness isn’t necessarily bad but it’s the vertical component which causes the most trouble with large distances between the lines of defence. This is most prevalent when the two central midfielders are forced out of position to maintain their man-coverage, with a chasm of space opening up in front of the defensive line. Hertha have to make sure they press the opposition with enough intensity so that they’re unable to exploit the space in between. Because of this deficiency, they often have to rely on applying enough pressure on the ball to stop the opponents from capitalising which obviously isn’t a sustainable method of defending. If there is one slip-up in the press such as a momentary loss of access or a poorly angled run, the opposition are given the opportunity to move the ball into a dangerous position behind the midfield. When they don’t manage to achieve a sufficient intensity they immediately come under significant danger. When they’re not looking to enforce a high amount of pressure on the ball, Hertha sit in a mid-block with more of a zonal-orientation as they look to maintain a stable shape over coverage of the ball-near opposition players. The two central forwards maintain coverage of the opposition sixes and attempt to block off any passes into the centre whilst 2 clear banks of 4 sit deeper in the block. Although they still have some reference to the positioning of the opposition midfielders, they’re less likely to move as far out of position to cover him. However just as in their press, Hertha have problems with maintaining compactness within the shape and their lack of staggering can result in open gaps being exploited by the opposition. There is quite often particularly large amounts of unprotected space between the lines and this makes them susceptible to overloads in the 3 central columns of the pitch. Many teams who have been faced with Hertha have looked to use a 4-2-3-1 with a narrow ‘3’ to create numerical superiority in these areas in the middle and to relative success too. In many ways this becomes an even greater threat to the defensive stability due to the lesser pressure on the ball, giving the opposition more freedom to move the ball into these open spaces. Within their own half, they can struggle to maintain control over their 6 space and can be prone to overloads in the centre, a serious problem for any defence to be faced with. Although they realistically have no chance of moving past 3rd place in the near future, Hertha’s turnaround from last season has been profound. Their aim for the final period of the season is to obviously maintain that last automatic Champions League spot and with a 4 point cushion over 4th they stand in a good position to do exactly that. Through intelligent acquisitions in the transfer market by GM Michael Preetz and equally-impressive performances on the pitch, Hertha have gone from scraping a 15th-placed finish last year to now leading the race for the 3rd and final automatic Champions League spot. For those who speak German, I recommend reading MA’s article on the German Spielverlagerung website!